Film #1 - Expansion to Air Power: 1944 - On the growth of the AAF from 1939 to 1944. Animated diagrams trace increases in personnel, planes, missions, and appropriations between flashes of world situations affecting these increases. Russian German pact is signed. Germany invades Poland, France, and other nations. Pearl Harbor is attacked. U.S. planes fight in Europe, Africa, and the Pacific. Japanese convoy is bombed and strafed. Pantelleria is bombed. Germany is bombed night and day. Estimates extent of AAF activities in 1944. B&W, 43 min. 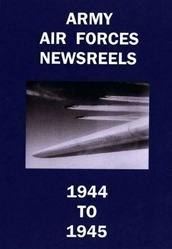 Film #2 - USAAF Newsreels 1944-1945 - Airborne invasion maneuvers England, Allied air front invasion bombers, invasion B-24Js and B-17Gs fly through flak, B-29 raid on Japan, Battle of France, Red Devil paratroopers: World salutes heroes who stood alone, Air giants speed Pacific war, Remember Arnhem, Truth about Ploesti, B-29s open air war on Japan, Saipan raid, Battle of the Bulge, Buzz bombs, Norden bombsight, Corregidor, Little Tiger Joe, Air pickup rescue, Bomber girls, Germany after defeat. B&W, 62 min. 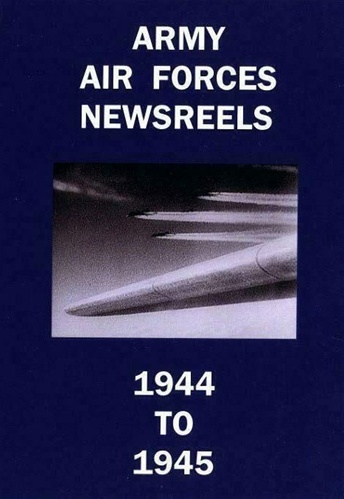 Total run time for Army Air Forces Newsreels 1944-1945 DVD is 1 hour, 45 minutes in B&W. Format is NTSC DVD.